If you don’t know me by now, one thing you should know is that I love all things Mediterranean. 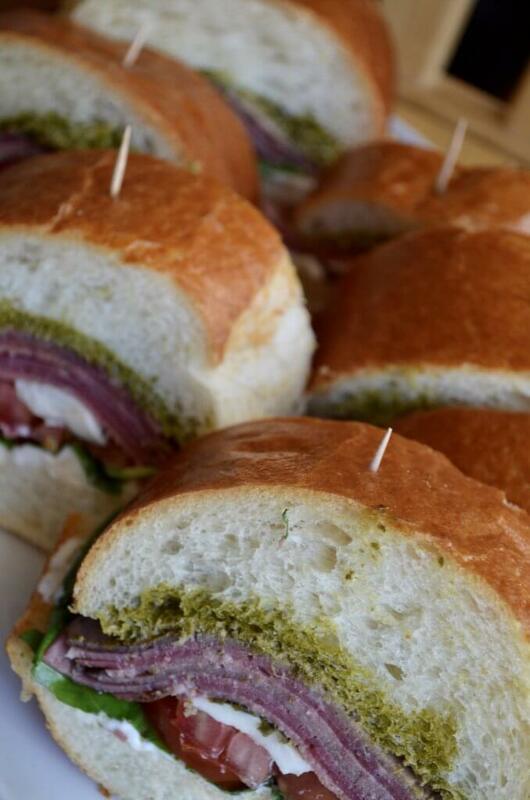 The food, the sunshine, the lifestyle…the FOOD. The food itself exudes sunshine, the sea and the rich volcanic soil of some of my favorite places like Southern Italy. That’s where some of the best tomatoes in the world grow, and for the best basil, you need a constant supply of sunny, dry weather. Since we lack a lot of that in the Chicago winter, and it’s been really getting to me, I decided to force a little sunshine into my life by making these Mediterranean subs with Deli Halal meats, since they are a wonderful source of healthy, halal protein (read more about their high quality and wholesome way of making their products here). 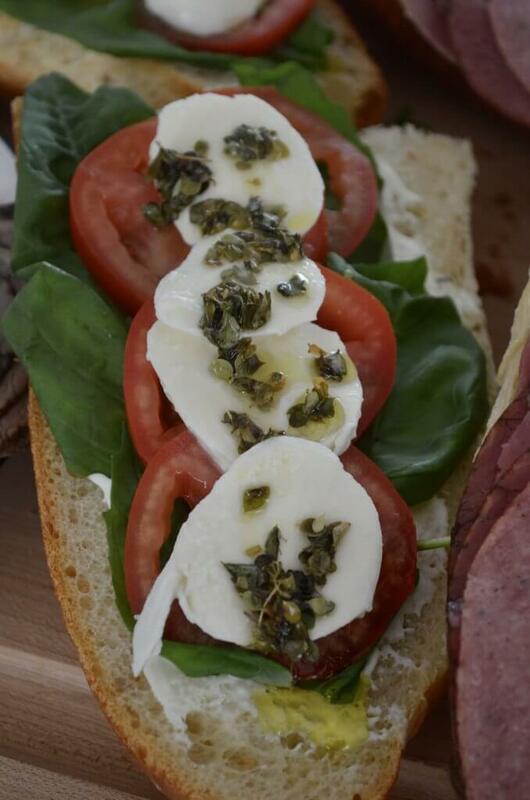 To make these subs, which are perfect for leisure weekend lunches or weekday school or work lunches also, you only need a few essential, but delicious and fresh ingredients. Most of these are things you could grab on your next trip to the grocery store and a couple of things you might already have in your pantry. Just be sure to find out where the Deli Halal is before you shop because their meats are what really make these sandwiches exceptionally meaty and delicious- and something I haven’t had in over a decade because I’ve never really found a deli meat I could say I would eat on a regular basis due to its great flavor, authenticity and commitment to being as wholesome as possible. To start out, I use all of the beef varieties of Deli Halal meats. They do offer a delicious, nitrite-free chicken breast but I didn’t include it in this recipe. 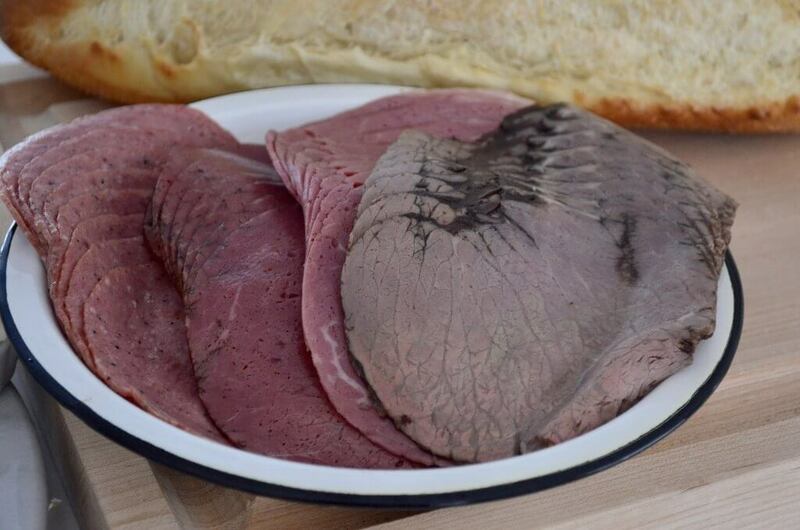 Instead, I used their Beef Pastrami, Beef Salami, Corned Beef and Roast Beef (which tastes like a homemade roast beef that has just been sliced). And, of course, some deliciously fresh rustic Italian bread, which I sliced in half on the horizontal so that I could add my spreads and toppings easily. 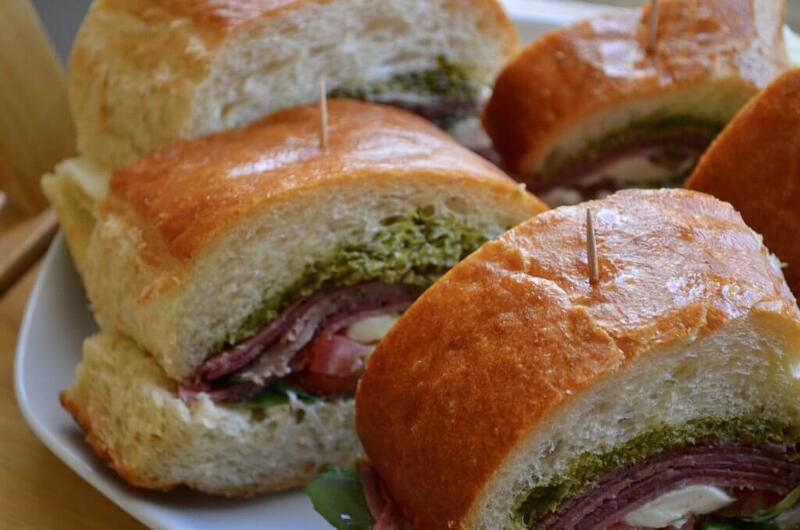 Rustic Italian bread- make sure it’s the real stuff and that it’s not so dense that you can’t really cut your teeth into it when you’re eating the sandwich! Pesto (make or buy your own. If you make your own, be sure you start off with the freshest pine nuts. If you have preserved your basil like I did here, making the pesto from that should be just fine). Good quality mayonnaise. Again, you can make your own or buy the kind with olive oil or an artisan variety. I particularly love the Lithuanian brands, which are easily found in the Polish aisle of many international grocers in major cities like Chicago. It’s just light and creamy and made with very few ingredients. Good quality bufala mozzarella cheese. If you don’t have this, sprinkles of grated Parmesan work well, too. If you have neither, try something like a thinly-sliced yogurt cheese. Fresh basil leaves. There really isn’t any substitute. Fresh tomatoes, preferably Roma or on-the-vine tomatoes. Again, no real substitute for these. (Optional) Fresh oregano in olive oil with a tad of sea salt. 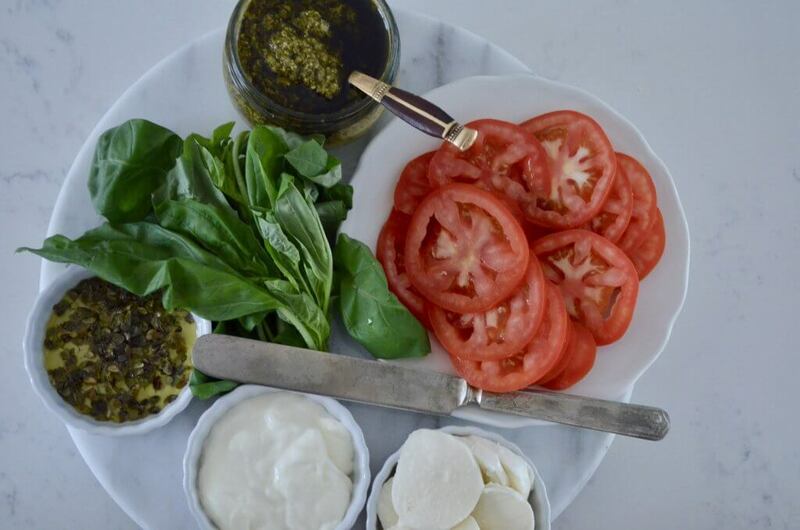 This is like an added dressing which you don’t really need because the sandwich will already have the pesto which is in olive oil, but it’s just an added touch I really like. 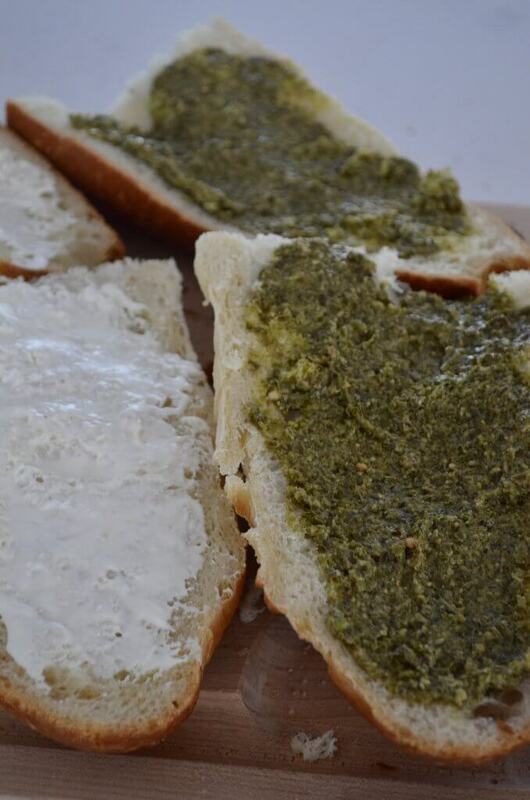 Once the bread is cut, spread one side with pesto and one side with mayonnaise. 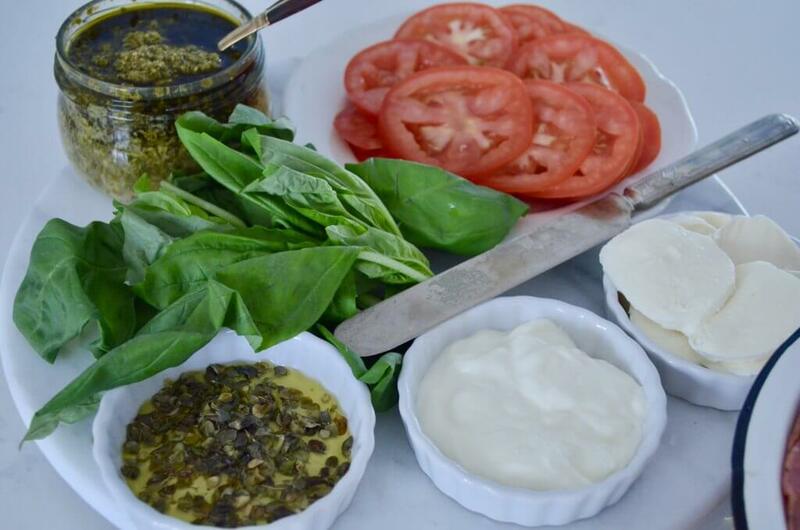 On one side, layer with basil leaves, sliced tomatoes, mozzarella or other cheese and the optional oregano oil. 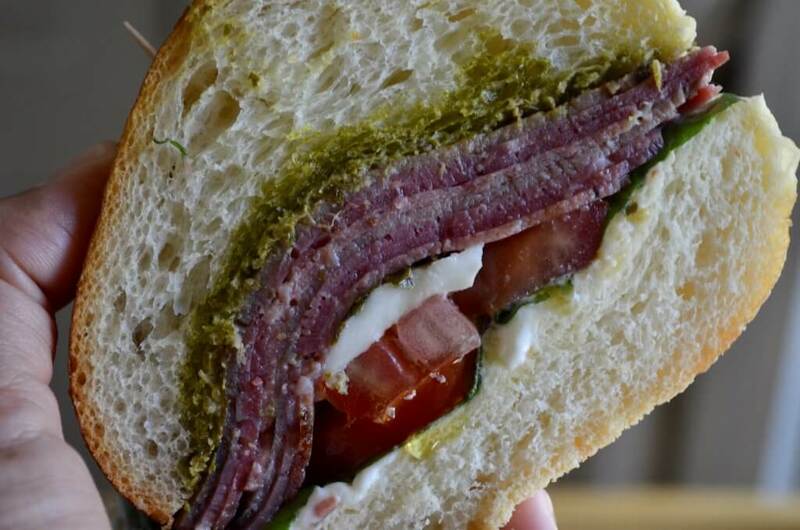 On the other side, layer with the stack of meats: Salami, Corned Beef, Pastrami and Roast Beef. Close them up and either eat them up (as is or warm for a bit in the oven/toaster oven) OR cut the bread into generous portions where the entire loaf can feed a small crowd. I add toothpicks to each portion to keep it all in place. Nice and meaty, full of flavors that are fresh and pungent and packed with healthy ingredients you can feel good about eating and serving. Serve as-is or after warming in an oven. Add toothpicks to each portion to keep it all in place. Sign up here to receive more updates about Deli Halal, including when and where they are in stores near you or to be subscribed to their newsletter. Deli Halal will also be participating in the upcoming I Heart Halal Festival in Chicago from April 13-15 at Navy Pier. Be sure to come out and visit so you can talk to them directly! 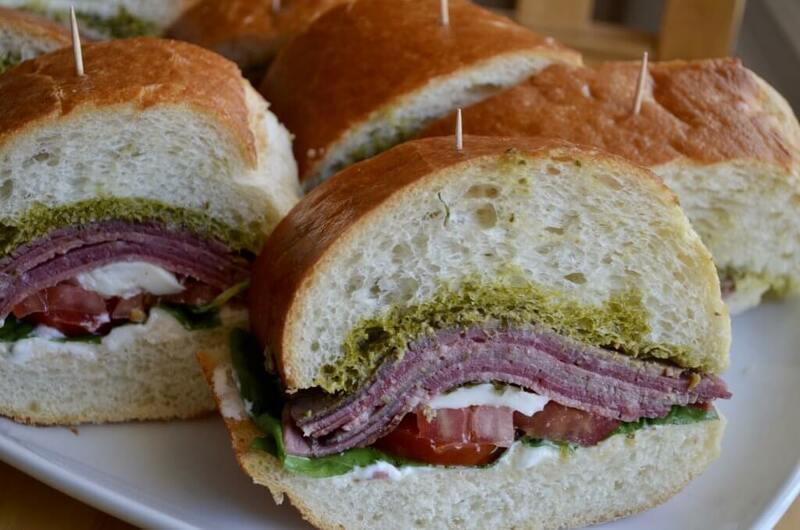 This entry was posted in American, Deli Halal, halal lunch, halal meat, Lunch, Mediterranean, Sandwiches, spreadthehalal. Bookmark the permalink.